This is a brand new, officially-licensed, Talking Key Chain of The Big Lebowski. 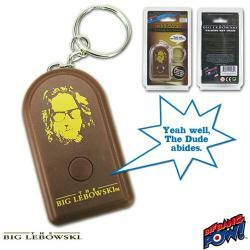 The keychain features as image of Jeff Bridges as The Dude and when its button is pressed, one of eight phrases will play. The keychain was produced by Bif Bang Pow in 2015 and remains new and sealed in its original packaging.